The Grand Cherokee SRT® boasts track-ready capability and first-rate standard features like a 6.4L HEMI® SRT V8 engine, smooth premium leather seats with perforated Ultrasuede® inserts, Active Noise Cancellation, Uconnect® 8.4 NAV and much more. See what happens when the engineers and designers of the Street and Racing Technology team get ahold of the Grand Cherokee. Go ahead, push the SRT to limit. It can handle it. And that’s because the Grand Cherokee SRT® has the most available horsepower in its class and a host of tuning features designed to help you make the most of your ride. The 6.4L HEMI® V8 engine delivers a considerable 475 horsepower through an efficient eight-speed automatic transmission. Use the fully electronic automatic shift mode or climb up and down the gears with steering-wheel paddle controls. Eco Mode and Fuel Saver Technology complete the equation for both power and efficiency. Drivers can simply dial and ride. The Selec-Track® System allows the driver to maximize performance. Each setting on the interface precisely adjusts the suspension, torque distribution, shift schedule, stability control and engine mapping. It helps the Grand Cherokee SRT® be both a comfortable daily driver and a quarter-mile sprinter, all in one impressive package. A bold blacked-out front end and brand new front fascia give the Grand Cherokee SRT® a look that’s all its own. Track-worthy performance requires wheels and tires that can transfer that power to the pavement. Grand Cherokee SRT® wheel and run-flat tire options are all new for 2017 and offer exceptional capability and stand-out style. Drivers and passengers can seat themselves in luxury thanks to world-class ultra-premium interirors. 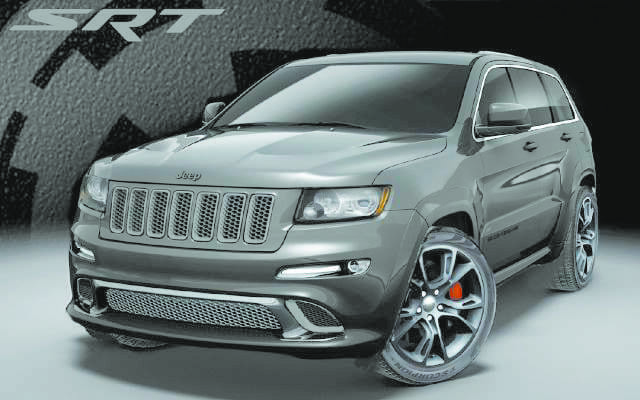 The Grand Cherokee SRT® features a track-ready interior that is loaded with world-class style and premium details. An all-new signature leather interior in black or black and dark ruby red and distinctive SRT shift knob complement the flat-bottomed SRT steering wheel. Race-inspired seating, a carbon fiber inlay and a 7-inch Driver Information Digital Cluster Display with instant G-force feedback combine to provide a thrilling cockpit designed to give you the ultimate driving experience.